Researched and written at the request of a true friend to New Jersey history. Beginning in the early nineteenth century, a variety of gentlemen societies established clubhouses along the New Jersey side of the Delaware River. Founded primarily by Philadelphians, these organizations normally formed around sporting activities such as fishing and gunning and their origins can be traced to the Colony in Schuylkill Fishing Company, which changed its name to State in Schuylkill Fishing Company after the colonies won the American War for Independence (Smith 1986:106). Writing about one these clubs—the Tammany Pea Shore Fishing Company—Isaac Mickle noted, “…the club had its origin in that old English social feeling which so strongly marked the generation of our grandfathers” (Mickle 1845:46). The Colony in Schuylkill Fishing Company, founded in 1732, is the earliest gentlemen’s club established in the English New World. Other similar associations along the New Jersey shore that existed during the nineteenth century and into the twentieth century included the Beideman Club, the Sparks Club, the Mozart Club, the Mohican Club, and the Riverton Gun Club. On the shores of the Delaware at Gloucestertown (now Gloucester City), Quaker City residents sought a variety of entertainment venues down through the years. Anglican pastor Nathaniel Evans, who held services in Gloucestertown during the mid-1760s, wrote a poem titled, “The Morning Invitation, to Two Young Ladies at the Gloucester Spring.” Evans died prematurely at age 26 and William Smith, a friend and admirer of Evans, published a collection of his poems, including the one just referenced, posthumously in 1772 by the subscription method (Evans 1772). Another early entertainment offered to an elite membership was the Gloucester Fox-Hunting Club. Belonging to this hunt association provided a certain cachet to its members, many of whom constituted the social elite of Philadelphia. The club operated between 1766 and 1818 before disbanding (Milnor 1889:405-429). Hunts usually ended at the “Death of the Fox” Tavern, a building that still stands in East Greenwich Township, Gloucester County, next to the railroad. Twenty years after foxhunting ceased, another group of Philadelphians, led by Izaak Walton devotee and sail-maker Jesse Williamson, formed a fishing club, which met below Gloucester Point. The broad, sloping Gloucester river shore had hosted fisheries since the early eighteenth century. Names associated with the fisheries there include Harrison, Ellis, Hugg, Shivers, and Clark. Beginning in the mid-nineteenth century, shad hauls at Gloucester became legendary, particularly once the hotels offered a delicacy known as “Planked Shad” (Prowell 1886:604-606). Prowell suggests that Williamson and his colleagues may have organized their club in 1828, but more contemporaneous evidence presented below appears to refute that earlier date, which earlier date Prowell provides with uncertainty. Initially, the members referred to their society as the Fish-House Company or the Williamson Fishing Club, as an homage to Jesse and his abilities “…in handling the rod and frying-pan” (Prowell 1886:604). The members, “…during the summer months, met semi-weekly under the large sycamore trees that once lined the shore of the Delaware, from Newton Creek to Timber Creek” (ibid.). Today this painting is in a private collection. 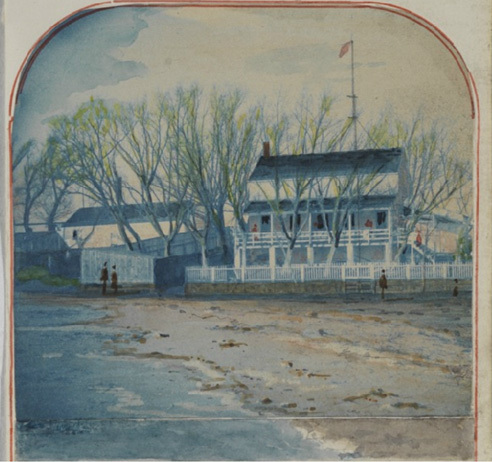 Notice the old fish cabin featured on the left side of the painting, a long-standing fixture on the South Gloucester waterfront. A similar article appeared on the first page of The North American and United States Gazette, even date. Notice the phrase “…for thirty years past…,” which strongly supports the 1838 formation date for the fishing club. To provide its membership with clear information on its functionality, the association published its governance documents in 1856. The Historical Society of Pennsylvania holds a copy of this 12mo, 11-page pamphlet in its collections. The original painting can be found in the David J. Kennedy Collection at the Historical Society of Pennsylvania. George Harvey, Walter Sterling, Joseph Fitzer and Chester Sterling, boys under 20 years of age, after a hearing before Mayor Boylan to-night, were committed to the Camden county jail on the charge of robbing the Prospect Hill Club House, near the old race track. The building was ransacked from top to bottom and among the articles taken were chairs, cutlery, liquors, spoons, clocks, spigots, dishes, looking glasses, pictures, shuffleboard weights, groceries, tubs, a meat block, and in fact everything movable. The plunder was removed to a boat house along the river and was offered to a second hand dealer who became suspicious and notified the police. 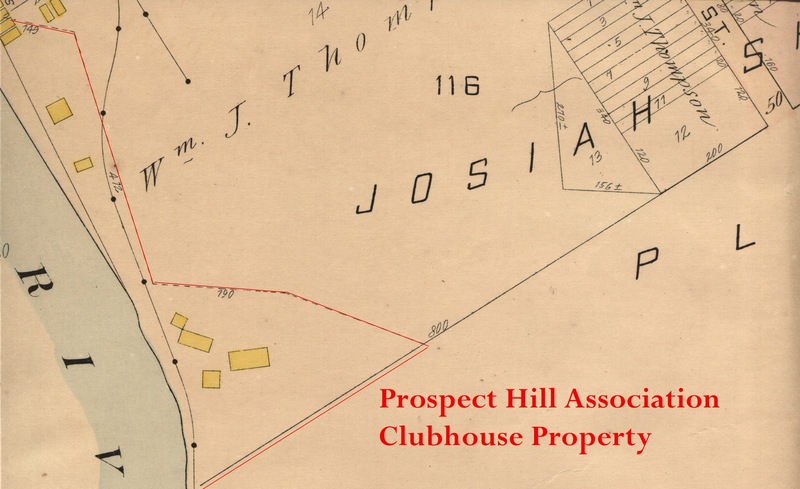 FOR SALE—Prospect Hill Club House, situated on the Delaware River, below Gloucester, N.J.; will be sold cheap. Thompson already owned the surrounding former Clark fishery and continued the tradition of fishing along the shoreline and served the shad in his hotels. When Thompson suffered financial reverses and became a bankrupt, protracted litigation ensued, with trial activity extending from April 1911 to June 1916 (The Philadelphia Inquirer 23 June 1916:3). Former Camden County Sheriff Henry J. 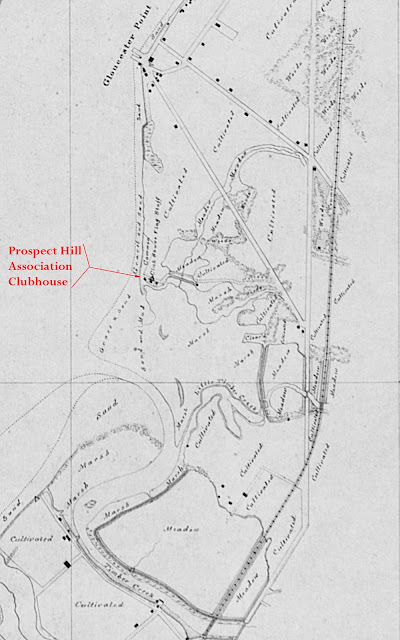 West served as trustee in the bankruptcy proceedings and sold much of Thompson’s land holdings to satisfy the creditors, including the former Prospect Hill Association clubhouse and outbuildings. Michael Haggerty and James McNally purchased the clubhouse property and received the fishery rights as part of the transaction. McNally intended to operate a large fishing net there in 1916, but the Pennsylvania Shipbuilding Company purchased the land from Haggerty’s estate and from McNally to build a shipyard in South Gloucester. A consequence of the shipbuilding firm’s acquisition of this property was a de facto extinction of commercial shad fishing in Gloucester (Woodbury Daily Times 14 March 1916:3). Construction of the shipyard and associated buildings, along with regrading the land for such industrial pursuits brought about the demolition of the once proud Prospect Hill Association clubhouse and its existence is hardly known today. 1842 Vicinity of Philadelphia PA. & N.J. Manuscript chart, T-165bis. United States Coast and Geodetic Survey, Washington, D.C. Original held at the National Archives and Records Administration, Washington, D.C.
1772 Poems on Several Occasions with Some Other Compositions. John Dunlap, Philadelphia, Pennsylvania. 1907 Atlas of the Vicinity of Camden, New Jersey. G.M. Hopkins and Company, Philadelphia, Pennsylvania. 1976 First Settlement on the Delaware River: A History of Gloucester City, New Jersey. Gloucester City American Revolution Bicentennial Committee, Gloucester City, New Jersey. 1845 Reminiscences of Old Gloucester or Incidents in the History of the Counties of Gloucester, Atlantic and Camden, New Jersey. Townsend Ward, Philadelphia, Pennsylvania. 1889 “Memoirs of the Gloucester Fox Hunting Club.” Published as an appendix in History of the Schuylkill Fishing Company of the State in Schuylkill, 1732-1888. By the Members of the State in Schuylkill, Philadelphia, Pennsylvania. 1886 The History of Camden County, New Jersey. L.J. Richards & Company, Philadelphia, Pennsylvania. 1986 Philadelphia on the River. Philadelphia Maritime Museum, Philadelphia, Pennsylvania. Fascinating, and as always, meticulously researched and elegantly written. For those of us with connections to these places, it is a great gift to have Jerseyman share his knowledge. I taught in Gloucester City for 32 years and was endlessly intrigued by the forgotten history of this once hub of Jersey history. Also, the description of the excursions of city school children across the river to NJ reminded me of my own city childhood and our Sunday School (Gloria Dei, Old Swedes Church) excursion by river ferry to Riverview Beach, among my happiest childhood memories. Thank you, Jo Ann. It is a joy for me to bring local history alive for my readers. Samuel Howell, Jr., of the Mount Misery Saw Mills and Hanover Tract, while not a member of the Prospect Hill Association, was a member of both the Gloucester Fox Hunting Club and the State in Schuylkill. Thank you, Tom, for the information on Samuel Howell Jr. It is edifying to me to have you reading and enjoying my blog! Think this, as usual, is the best and last word on where Ft. Nassau stood. Thanks.